SENER and Dow will display their solutions for the Concentrated Solar Power (CSP) market at Expoquimia. 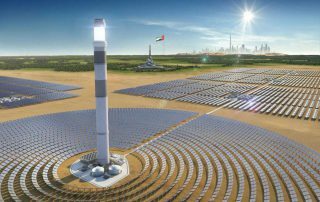 Construction on Bokpoort and Noor 1 have begun, with both Concentrated Solar Power (CSP) plants planned to go live in the second half of 2015. Executives from Acciona, Dow, SENER and TSK met in Madrid this week to celebrate the companies’ strong relationship and commitment in emerging Concentrated Solar Power (CSP) markets. EPC majors celebrate award of Noor 1 and Bokpoort Concentrated Solar Thermal Power (CSP) plants. DOWTHERM™ A heat-transfer fluid from Dow is a key component of the steam-heating process in concentrated solar power plants and replaces conventional fossil-fuel boilers. Dow will be showcasing a range of solutions including DOWTHERM A, the world's leading specialized High Temperature Heat Transfer Fluid. Dow provides the world's leading fluid, DOWTHERM™ A, a specialized High Temperature Heat Transfer Fluid (HTTF) used in more than 30 of the largest CSP projects around the world. Solar power technology like CSP offers many advantages in regions that require reliable new sources of energy. 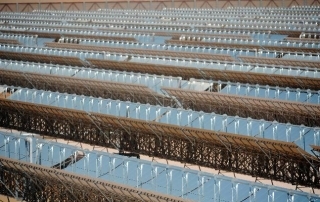 Concentrating Solar Power uses parabolic mirrors to reflect and magnify heat from the sun onto a closed circulating loop containing DOWTHERM™ A heat transfer fluid.